TC Mag reports ADATA is now shipping the S511, a SATA 6Gbps SSD with SandForce's SF-2200 series SSD controller. The S511 SSDs feature a 2.5-inch form factor, MLC (multi-level cell) NAND Flash memory, a MTBF of 2 million hours, TRIM support, they include a three-year warranty, and deliver read and write speeds of up to 550 MB/s and 520 MB/s, respectively, and a 4k random write performance of up to 60,000 IOPS. 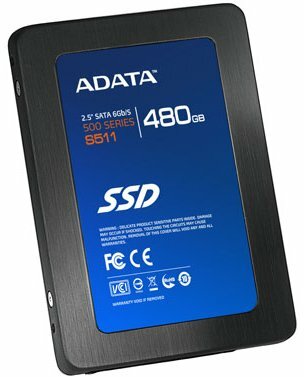 A-Data's drives are still in pre-order 'mode' in Europe and are priced at €124.90, €214.90, €454 and €1,193 for the 60GB, 120GB, 240GB and 480GB models, respectively.